You are here: Home / Learn / How long can I keep tea in the fridge? 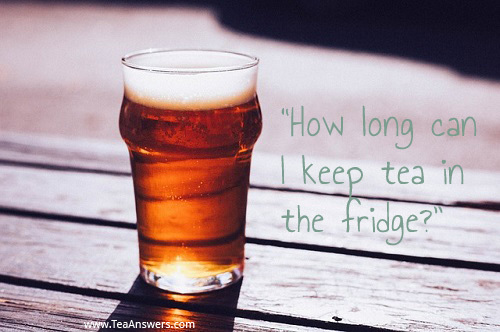 How long can I keep tea in the fridge? That’s a great question! During the heat of the summer, it’s always nice to have some cold tea on hand to make iced tea. Tea is a lot like coffee. Both should only be kept for about a day – even when kept in the fridge for iced tea. It doesn’t have to do with food safety, but rather with the quality of the tea decreasing as it ages. If you don’t notice a difference in flavor when you keep tea in the fridge for longer, then by all means keep it for as long as it tastes good to you. With one caveat: it’s probably only safe to keep it for a week at the most. I’m not an expert on bacteria growth in tea, but a week is generally how long most prepared foods can be kept in the fridge before discarding them. When you keep tea in the fridge, make sure you keep it in a tightly sealed container so that it doesn’t absorb flavors from others food in the fridge. As for me, I rarely keep tea in the fridge. I usually drink my tea hot and brew it fresh each time. I will make cold-brewed tea in the summer. Clearly, this is kept in the fridge. But I usually make only a few servings at a time and drink it within a day as iced tea. If you want to learn more about how to make iced tea and cold-brewed tea, learn more with my Guide to Making Iced Tea.